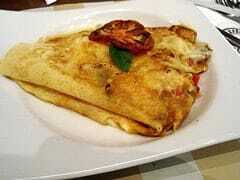 Home » Copycat Restaurant Recipes » La Creperie Fresh Berry Crepe – make crepes just like the Paris hotel in Las Vegas. Le Creperie is located in the casino, Paris in Las Vegas. Here is one of their restaurant’s favorite dishes. You may want to cut this recipe in half. Make Crepes just like they in the Paris Hotel in Las Vegas at the La Creperie. In a food processor set with a metal blade, place the flour, sugar, and salt. Add the eggs and process with pulsing action. Add the butter, milk, and water. Pulse to combine. Pour batter into the container and refrigerate for 1 hour. Spray frying pan or crepe pan with non-stick spray. Heat pan. When hot, ladle enough batter to thinly coat the surface of the pan. Cook on 1 side and flip. Cook on the other side. Remove from pan and let cool. Continue making the crepes, spraying pan prior to making each one. Fill each crepe will mixed berries and a little raspberry coulis. Top each crepe with more berries, coulis, whipped cream, and finish with a dusting of powdered sugar. 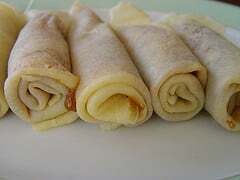 Delicious Recipe ~ Best crepes ever. I made mine with strawberries – awesome.